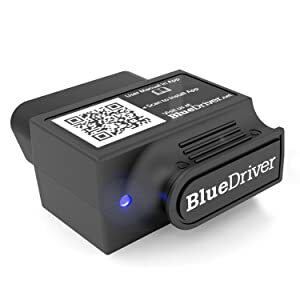 Want to read the honest review of the FIXD vs Bluedriver OBD2 Bluetooth Scanners? Let’s take a closer look at the FIXD vs Bluedriver comparison below and take the best one for you. Cons Inconsistent; not support ABS and transmission for all cars. Not compatible with iPad Pro with iOS 11.x. Not support ABS, SRS diagnosis; Possible issues with Bluetooth connection and Compatibility; Slow tech support. Bottom Line Bluedriver is a great pick for car Enthusiasts and DIYers. The Fixd car health monitor is made for hands-on drivers. BlueDriver is a compact and efficient device that has some unique features for keeping your car in perfect condition. The scanner’s Bluetooth technology is compatible with iOS as well as Android operating systems. BlueDriver is a compact and efficient device that has some unique features for keeping your car in perfect condition. The scanner’s Bluetooth technology is compatible with iOS as well as Android operating systems. Testing emissions so that smog can be prevented, etc. 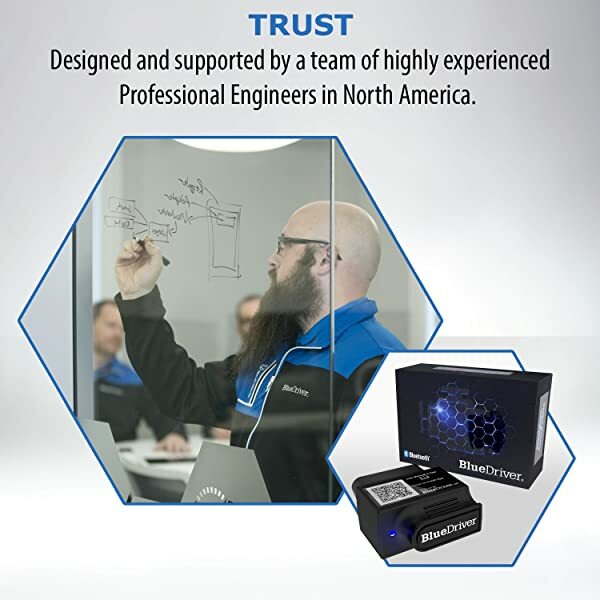 Bluedriver is designed and supported by professional engineers in North America. One of the major advantages of the BlueDriver OBD2 Bluetooth scanner is that all its components are manufactured in America. The parts are designed by qualified and skilled engineers keeping the safety aspects in mind. The product passes through a series of strict quality control tests. You can download the BlueDriver application free from App Store for Apple devices or Google Play for Android devices. The sensor works efficiently with both the operating systems and produces data regarding engine efficiency. It will a useful purchase whether you have an iPhone or Android smartphone. The scanner will also alert the driver if the CEL is malfunctioning and an error report will be generated. The BlueDriver scanner will also give you a report on what needs to be serviced, repaired or replaced. Through the scanner, you will indirectly have access to the vast database of expert repairs conducted by qualified technicians. Every second the scanner is comparing the performance of your engine and the emissions against the database. 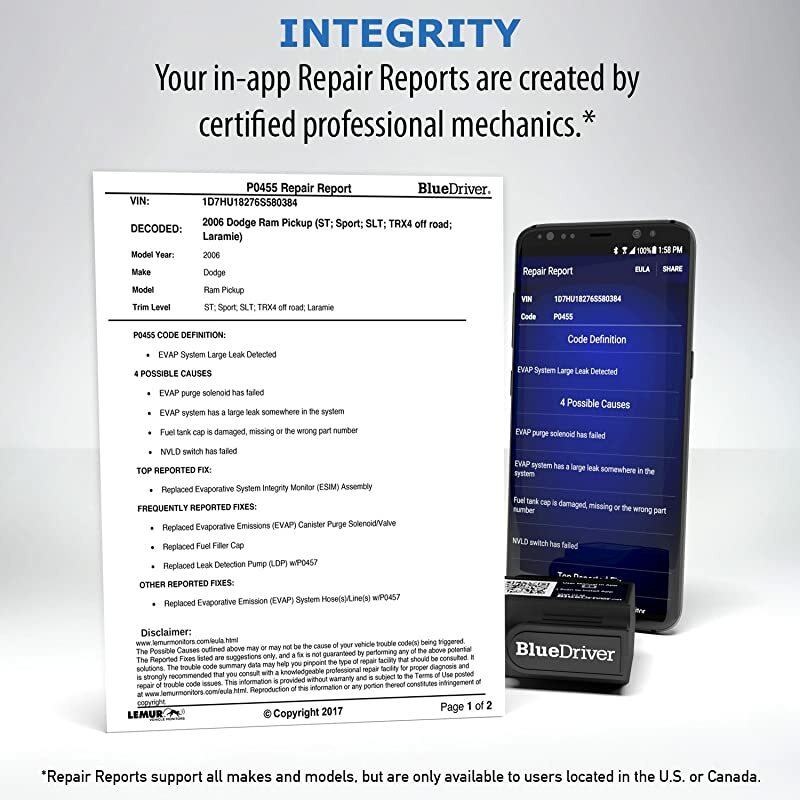 You can immediately mail the report via your smartphone directly to your regular car mechanic to save time and money. The impending smog alert is the most unique feature of the BlueDriver when compared to other similar scanners. The emissions are tested by the scanner. It alerts you on even the slightest unusual readings in the emissions. This keeps your car in a fuel-efficient condition and also prevents air pollution. In case of errors, you must take the car immediately to the car mechanic for servicing. You will benefit in the long run because regular servicing will prevent costly repairs later on. The only downside of the BlueDriver Pro OBD2 scanner is that it doesn’t work with Windows-based smartphones. Going by user reviews, the scanner price is good compared to its versatility. The live data graphs/gauges, recording, reporting and exporting data is very user-friendly. The Mode 6 descriptions need some improvement for Apple devices. 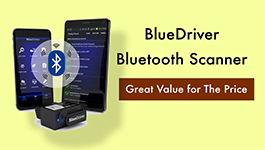 BlueDriver is a great Bluetooth Professional OBDII Scan Tool for Enthusiasts and DIYers. Just like most other OBD2 scanners, he compact FIXD Car Health Scanner too works well with Android or iOS smartphones. It collects and analyses information about the CEL and summarizes it for necessary actions. Just like most other OBD2 scanners, he compacts FIXD Car Health Scanner too works well with Android or iOS smartphones. It collects and analyses information about the CEL and summarizes it for necessary actions. 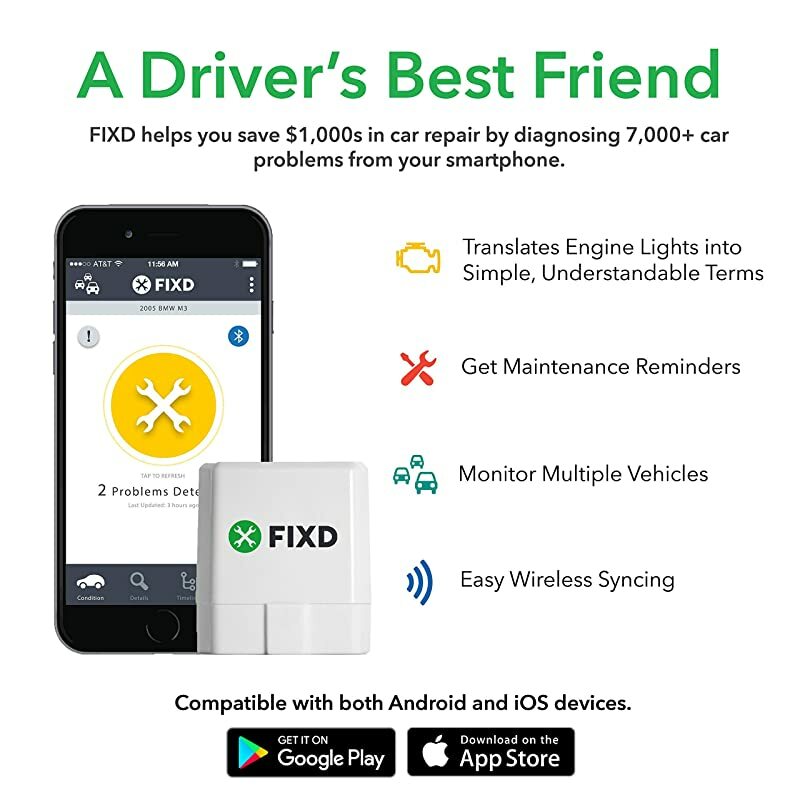 FIXD is a driver’s best friend that helps you save thousands of dollars in car repair. An error report is generated by the FIXD scanner within a minute. You must immediately email the readings via your smartphone to your regular garage mechanic. If you resolve the problem early, then it will save you a lot of money in the long run. If the scanner is not installed, and if the CEL is not functioning properly, you could end up with a huge car repair bill. Prevention of major breakdowns is the biggest plus point of the OBD2 scanner. 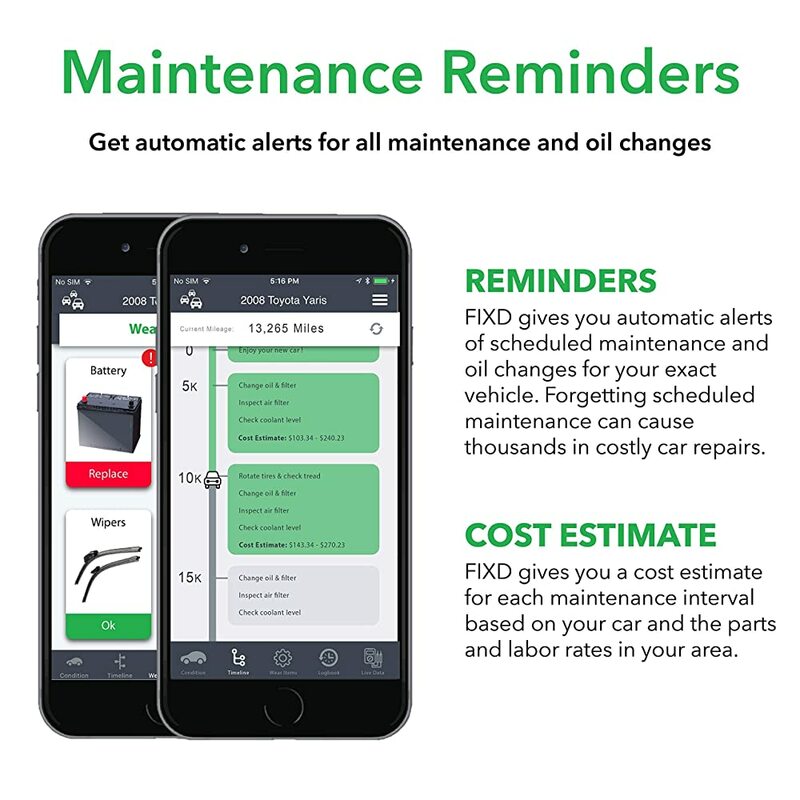 The automated oil-changing reminders is a unique advantage of the FIXD scanner. Another advantage is that the same device can be configured to monitor more than one car belonging to the same family as a group. This does not mess with the efficiency of the scanner. Instead, it produces accurate real-time data for each vehicle. Each car user can access the relevant reports and give the car for maintenance on time. If you are an owner of a lightweight truck not exceeding 14,500lbs of gross vehicle weight, then you can use the FIXD Bluetooth scanner and configure it with your smartphone. This is a very exclusive feature of the FIXD that other scanners do not have. The push notifications on your mobile phone will alert you if there are any unusual readings. This will help you to keep your truck well maintained and running smoothly. A truck that doesn’t break down will be a real asset to your company. The push notifications on your mobile phone will alert you if there are any unusual readings. At present, the FIXD scanner can only give alerts on CEL readings, transmission, and emissions. It does not provide airbag alerts or monitor the anti-lock braking mechanism. Also, it is not compatible with smartphones that have the Windows operating system. Reviews by users state that the scanner is easy to set up and the first scan showed a defect in the O2 sensor. For some mobile, the interface doesn’t work that efficiently. But the product is generally considered value for money. 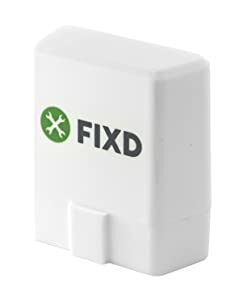 FIXD is a good Car Health Monitor for Hands-on Drivers. Which Bluetooth car health scanner you select depends on a number of factors. If you need it for a lightweight truck then BlueDriver is of no use to you. FIXD is the only choice. If you wish to configure more than one car on the same scanner, then the FIXD will not be of use but BlueDriver is your best choice. Again, if you are looking for some exclusive add-ons like airbag alert and braking system alerts, then the BlueDriver has the upper hand. Of course, these additional capabilities will cost you more. But considering the additional safety measures that your car will be equipped with, the scanner will be worth the price. In the FIXD vs Bluedriver race, the ultimate decider will be the end use of the product. What features you are looking for, how useful are these features to you specifically and how much is the cost? Your choice will depend on all these factors. If your car is OBD2 EOBD compliant then KONNWEI KW818 Scanner is a must-have diagnostic tool. But what this scan tool can offer? Check out the honest review now!